The title track, "Texas in the Man," was auditioned for the internationally acclaimed FAME GAMES RADIO CONTEST and, after being evaluated by the Fame Games Production Team, the song was accepted into the contest. Fame Games is an international radio show focused solely on the best undiscovered Indie music. Any style of music is welcome but the main Fame Games focus is on music with crossover potential so it's a great opportunity to "convert" others to your kind of vibes! The show is broadcasted terrestrially in the South of Spain to the largest expatriate, English-speaking community in the world. Over the past year (2006-2007) Fame Games has also become the world's most-listened-to webcast, with a total worldwide audience in excess of 1,500,000 listeners and growing. Presently, the average monthly listenership is around 350,000 unique visits. Fame Games has a global reach and will soon start syndicating its show to radio stations all over the world. Fame Games is also an A&R vehicle for MMI and many other potentially interested labels. Fame Games has been referred to as the "American Idol" of Radio & Internet. After being accepted by the Fame Games Production Team, "Texas in the Man" was entered into the "Green Room" portion of the show. This room contains somewhere between 80 to 100 other artists of all genres from the four corners of the globe. "Texas in the Man" was then reviewed by Peers (other artists as well as record label A&R people) and Listeners where it gained enough Fan support to leave the "Green Room" and move into a Qualifier show. "Texas in the Man" moved out of the "Green Room" in only about 7 days. Thousands of artists are never fortunate enough to move from this phase to the next. 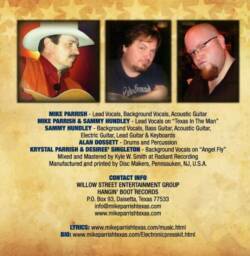 "Texas in the Man" was now a CANDIDATE for the Qualifier Showcase. "Texas in the Man" aired on the Fame Games Qualifier show, Edition #140, and was heard by a couple of million listeners around the world! Votes and reviews continued, additional expert reviewers join the process. The qualifier show is limited to only 15 artists. "Texas in the Man" moved into the Qualifier show, rated by reviewers and votes as the #1 act in the show. The song dropped to #2 for a short while but moved back to #1 just before it was chosen as a CONTENDER for the Main Showcase. "Texas in the Man" received a score of 13.67 out of a possible perfect 15.00 with it's closest competitor, The Influence, nipping at its heels with a 12.86. "Texas in the Man" then received double the exposure on the world's #1 Indie Music Show and became a CHALLENGER for the Track of the Week. Only 4 artists or groups are chosen from the Qualifier to move on to the Main Showcase. The Ennis Sisters, (Folk Rock / Roots Music / Pop) of St. Johns, Canada were the current Track of the Week holders with their song "World's Apart." The Ennis Sisters are an accomplished trio who has toured with the Nitty Gritty Dirt Band, Mary Chapin Carpenter, Bruce Cockburn and more. Wil Maring, (Americana / Bluegrass / Folk) of Cobden, Illinois was another qualifier with her song "Keeper of the Farm." Mikey Power, (Reggae / Pop / R&B) of Toronto, Ontario Canada also qualified for the Main Edition with his song "A Man Called Poverty." Also joining these artists was a group known as The Influence, (Alternative / Rock / Acoustic) of Virginia Beach, Virginia with their song "Ocean of Mine." "Texas in the Man" had found it's way to the very top of the largest Indie Radio show in the entire world, which was quite an accomplishment in itself. One reviewer said, "(17-Jun-2007) A fine slab of shuffling boogie to finish with. There may be nothing wildly original in it, but it is certainly great feelgood music. And isn't that reason enough to listen to a piece of music? I should say so. Well produced and well played, and I can fell the audience bouncing from here! Yeeoowww!" Another reviewer said, "(21-Jun-2007) Well you can't beat a bit of blues rock can you! Had me playing air drums throughout! Ha! I'd love to hear more of this kind of stuff on mainstream radio...now there's a request Mr DJ?" A third reviewer said, "(21-Jun-2007) Great jam music for a corn roast! These guys are tough. I can tell! I like it. It has balls in that classic southern rock style! All the best y'all!" Still another had only this to say, "(16-Jun-2007) Yeee-haaawwwww!" The Fame Games Panel review was, "This is a completely enjoyable, fun track, very much in the vein of ZZ Top, but with two good vocalists. The second one especially reminded us a litle bit of a young David Coverdale - and you can't do much better than that! Smooth but rockin'! This song is guaranteed to get the crowds going - the only (small) point is that for a successful crossover recording, it would need to be even more edgy and, perhaps, "wild." There are also moments where the playing or the arrange-ment, which is otherwise excellent, feels like it could do "more." But this doesn't detract from the fact that we all loved this piece - and we're sure so will a lot of people!" The Fame Games Panel further added, "While ZZ Top comparisons are almost auto-matic, this is not to say that this band is a "clone" - they've got a sound of their own, largely helped by the excellent lead vocal. Highly recommended, gutsy rock n roll!" When the competition had concluded, the Ennis Sisters won Track of the Week for the second consecutive week (14.24), The Influence took the runner-up position (14.18) and "Texas in the Man" finished in a very strong 3rd place (13.94). Mikey Power was 4th (13.45). Wil Maring was 5th (13.37). But that was 3rd in only the Main Edition Competition because, in accomplishing this feat, "Texas in the Man" set several new Fame Games records along the way. "Texas in the Man" received one of the highest review scores ever seen on Fame Games. The song set an all-time record high taking the #1 position in Listener Votes (Votes cast by email by the listeners) and placed the song in Fame Games Hall of Fame!. Nothing like them good old boys Jamming down . . . I could feel the attitude in the music, before the vocals even began. Way to set the mood! The guitar is funky and really rocks. Makes me miss Chris Ledoux! You have that kind of bad boy cowboy sound. Great hook. Awesome vocals. Perfect melody for this song. Love it! Interesting hook. The arrangement works well for the lyrics. Mood is perfect for the song. Nicely done here. "SongoftheYear" Review: "The lyric is soulful and thought out very well with a pleasing upbeat melody that implements the mood precisely. This song has the essence of country with blues sensibility. The title has a wonderful place and this makes the song very memorable. The song is marked with an accomplished composition and powerful vocal performance. Your professional approach to your craft is stunning. I'm most impressed. The musical implementation has strong resolve and a playful sound that gives the song life. Great job! The composition is entertaining and professional. It would be fruitful to get it to an established artist(s) with a suitable style to capture the rhythm and soul of this composition and propel it into the musical charts. "Blue Jean Baby" is currently entered into the Internation Fame Games Radio Contest and, while still in the "Green Room" (not even in the thick of the competition) the song is holding the all-time record for the #2 position in Listener Votes (Votes cast by email by the listeners). 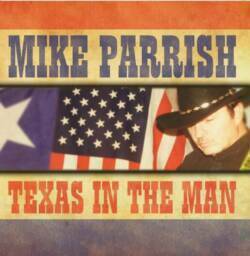 Oddly enough, the All-Time #1 Listener Vote Catcher is Mike Parrish & Sammy Hundley's "Texas in the Man." Everyone is very anxious to see how this little Country / Southern Rock ditty will fare against the world class competitors of Fame Games. "Blue Jean Baby" exited the "Green Room" on July 6, 2007 and entered the #143 Qualifier in the #1 Position, the strongest contender for the Main Edition. The song entered the Main Edition and ultimately won "Track fo the Week." I can't think of a single thing to fault. Brilliantly written, performed and produced. I normally write my reviews whilst i'm listening to the track...but this song i had to wait till the end. It's a hit, all the way. Great work from everybody concerned. The guitar work was really great! The song is fun and upbeat with an appropriate hook line. I think it was interesting doing unison rather than harmonies on the last line. This is a great boogie-woogie song that had me dancing in my chair! OW!!! MY FEET ARE SORE! How dare you post something that keeps my foot tapping like this does. My wrists are sore from playing air guitar. The hook won't leave my head, you have created another earworm, those tunes you can't get out of your head. You have a lot of nerve putting something so infectious on the internet. 1)The lead guitar playes like a cross between B B King and Geaorge Thorogood and was a pleasure to listen to I was playing air guitar all the way. 3)The sound again no fault here I enjoyed your song I was entertained thank you. I hear rockabilly coming out of this!! Lead guitar of course is very impressive here. The hook sounds very familiar..possibly so retro because of its rockabilly sound. I like it! Very danceable and catchy! Lyrics make this piece. Fantastic. The meter is perfect. Almost rockabilly but more refined. Production was great, all balanced well in the mix, no hogging. Fine set of musicians from the drummer to the vocalist. Great effort. like your style. It's Catchy. The Guitar fits great. And the lyrics sound really country. One of the best songs I've heard on this site. First let me say that I love the rockabilly, upbeat sound. Had me dancing in my seat. Lead guitar is amazing. Very talented. Great hook. Sounds very well put together. Nice production job. I'll listen to it again, for sure. This song is new country thru and thru! Hot guitar and guitar makes this a moving song. Not much melody but has a lot of action! Great sound guys! Love the guitar work...great southern boogie sound. Excellent arrangement and hook. If I could be critical about this song...I would say cut the reverb...you definately don't need it dude. Nothing boring about this song. It has a classic country rock feel with a contemporary flair. Nice male vocals,great beat and mood. Loved the dirty lead guitar riffs. Cute playful lyrics. I could see this being played at any honky tonk everywhere. Wow this track would be awesome in Europe right now. They are really diggin classic rock. This a awesome song and its got some really great production. I loved the lyrics and it made me want to swing man! This should make the Top 40..
Great screamin' guitar intro. Can't stop tappin' my legs while listening to this song. Woepie, this is real good dancin' swinging old school country rock. Nice outro with smooth female vocal at the end. It's a pitty she isn't doin the backing vocals in the rest of the song! Maybe somethin' for the live version? I think I know this dude...knew it right away when the song came up. Cat didn't waste no time, blew the doors off and rocked the house. man, if i was in a honky-tonk about 12 midnight and the band cranked this out, i'd duck for cover and try to stay out of the way to keep from getting trampled to death by all the chicks running to the dance floor...a definate country rocker..the thing drives...lead guitar is killer... this is one helluva good piece here. Outstanding. Who's a good guitarist then? No nonsense heads down boogie. Great sound - excellent guitar and very tight band. I imagine you guys go down well live. Nothing to criticise - if you're in the mood to listen to some upbeat blues, you'd be hard pressed to find many better tracks than this. Slow them Horses Down, Lets all stop and Listen, I haven't heard an Edge and Groove like this since the KENTUCKY HEADHUNTERS. THIS IS SPECTACULAR!! LOVE THE GUITAR TRACKS, IT HAS A ROCK-A-BILLY FEEL MIXED WITH A GOOD Country Voice. I like it!!! Good song. Good picking. Good singing. What more could you ask for. You ought to on the radio. Upbeat, good electric energy, easy on the ears, guitar licks are smooth & don't tear your ears up; sounds like a fun song to dance to naked in a barn with a few cowgirls! Yeeh haaW!! Great intro, had me rocking in my boots and it just got better from there! Very catchy tune with some great picking going on and just the right amount of Lead guitar fills. Great solos. Brilliant sound that has enough originality to not sound "done before". "Better not mess with a blue-jean baby"...HA HA! I like it! Had a good laugh at the end! Great song guys, if this isn't on the radio yet, it should be! "I'll Still Be Your Man"
"SongoftheYear" Reviews: "The lyric is accomplished and there is a nice story behind them. There's good emotion through the song and the musical ideas show clear technique for writing. The title is a wonderful choice. The composition is thought out through every detail. Very good job! It is a pleasure listening to this composition. The listener feels familiar with it since its beginning. The chorus is impressive and involving. Great job! I cannot but praise the originality of the songwriting and the good taste about the overall arrangement and performances. Traditional yet with a unique style that represents strong songwriting talent." "I Can't Tell You Goodbye"
"SongoftheYear" Reviews: "Lavish in production, arranged and executed with strong musicianship. "I Can't Tell You Goodbye" is a progressive journey into orchestrated and textured classic country sounds with a touch of gospel class. Lyrically, this is poetry with great depth in content, sharing wisdom and vulnerabilities. The music pushes you forward, inward, outward and through various layers of sounds. Balanced guitars with the cushions of organic sounds create dynamics and soulful melodies. The full on production, solid rhythm tracks and a voice of calming and comforting tone makes this a very strong and ambitious song. An emotionally driven track with memorable performances. Great job!" Very nice intro. Awww, wish I had a girl to twirl around. Guitars and piano sound good. Nice vocals. Typical cowboy love song on the lyrics, though. Nice, clean, simple lead solo. Fits well. "SongoftheYear" Reviews: "Unique singer/songwriter artistry carries a comfortable strength in the vocal performance and lyrical interpretations. This is a rhythm pleaser with solid musical performances that draw the listener into a state of familiar country delight. Great musical arrangement and instrumentation not overwhelming the production - or the simplistic textures that work so well. What makes "Color Me Gone" attractive to the listener, whether you like country or pop, is the amount of musical warmth, words worth hearing, and the production that compliments the voice that give the music life. Promising." "SongoftheYear" Reviews: "A powerful, unique and compelling song that comes from deep within. This is a worthy composition. Solid melodies with a powerful arrangement compliment the emotional storytelling. The textured sounds and reflective lyrics lend well to the listener's sensitivities. The musical experience is powerful - voice, musical arrangement and passionate delivery by all involved. The words flow with the melody in the chorus. The timing is perfect on the notes and the energy you share is sweet and tender. Empowering." I really enjoy how your song tells a story. In particular, I like the line that says "When she gets home, she's sings in the mirror/ the angels stop singing so they can hear her." That is a nicely crafted line. opinion is that the change stifles the fluidity. Food for thought: maybe you could save the 4:4 rhythm for a small part of the song that you want to stand out, or maybe even do away with it altogether. Melodically, I was really waiting for you to go to 6m or 2m chord when you hit the chorus. Moving off of the 1 chord might channel more attention as well as help improve the prosody. But at the end, I appreciated how you drug out the word "high". That was nice. Moodwise, I enjoyed the inspirational quality of your song. I find it refreshing when people deviate from the standard subjects in country music of alcohol and loss. Overall, good potential. Good luck with your music! tHE first topic that called my attention was the intro melody...and surprisingly when i ve read about what you care about...one of the topics was..melody..well...your melody is nice.. You have a very nice vocals here....Mood...is nice....I like the way you songs changes from the first second to the 1 on the go..... Well..hope you the best..cause you have here a song that could be named the best. Not expected in country, but very nice drum fill into verse. Gives a nice start. 58 seconds insta build and mellows until the chorus which comes very quickly after nice touch. Lyrics are good. very well sung. Got some clever lyric in there. Nice mix. All the levels are very nice. Reminds me of California Country POP.... I dig it... The guitar licks that pop in and out are so nice give it a very SOuthern Blues feel. "Ain't We Got It Good"
"SongoftheYear" Reviews: "The title is one of the elements of a song that a listener will remember and look for, but only if he/she likes the song. "Ain't We Got It Good" is very compelling. The first thing a prospective fan will hear, besides the intro, is the first line of the lyric. The lines are intriguing and awaken the listener's interest and convey the patriotic message of the song. The overall arrangement and precise, clear ideas propagate throughout the entire song. The placement of the chorus and the phrasing work as an unforgettable hook. Great job! The song's devoted and touching appeal makes you feel familiar with every line of the reflective lyrics, which in turn make this relatable to the audience. Great work! It is enjoyable from title to the last note!" "A Soldier's Mind" Review: "Deep in the heart of Texas, lives a man who fiercely loves his Country and is thankful for the gift of freedom that has been given to us, through sacrifices made by the men and women serving in our Nation's armed forces. 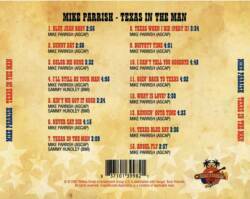 It is an honor for me to be able to introduce our readers to our latest Tunes For The Troops featured artist, Mike Parrish. I had the distinct pleasure of being able to speak with Mike last night on the phone, about his great song that is dedicated to the troops, "Ain't We Got It Good." His song has a message that not only we need to hear but our troops need to hear as well, written from the perspective of a person sitting and watching the fireworks on the 4th of July and thinking about the reasons that we have the freedoms to do so. It makes you think about how lucky we are to live here in the United States and have the liberty to do and say what we want, go where we want and do what we want… all because brave men and women have fought, bled and died to allow us that liberty." **NOTE - Mike's song was featured on this MilBlog in the company of internationally known artists such as Ted Nugent, Toby Keith, Winger, and Lynyrd Skynyrd. "SongoftheYear" Reviews: "The lyrical aspects show a clear story and theme with an easy to follow musical formula. The wording is engaging and inventive with colorful, evocative imagery. The chorus has a strong sense of originality with very effective lyrical structure. The arrangement show clear and precise ideas that are adapted to music very easily. The overall sound is traditional yet has a contemporary sound that is unique and refreshing. The intriguing guitar introduction grabs the listener right from the start. The performances are stellar and accomplished. This is well conceived and composed. The ideas are presented in a clear and professional manner. This is an exceptional song with formidable hit potential." Thank you for makng my day! Oh I am so glad to hear this right now. Finally something nice to hear! The mood is very festive and I knew there was something Texan in it once I heard the guitars. I love how it picks up around 1:08 and that guitar riff is hot! To be honest you sound a bit like Jerry Garcia but also have an original sound there too. Very nice guitar work , i really like the way this song flows ...Song is very easy to get into ... Overall well done ! Not bad at all. Then the vocals come in and I'm not disappointed. And it only gets better. Great performance. You have my vote. This mellow song is nice. The acoustic intro is very smooth. Good lyrics, good vocals/harmonies. Overall a good job! I like the harmonizing guitars. Nice togetherness on the harmonies as well. You reminded me of early LITTLE TEXAS. Also, strangely enough, some early 80's stuff like the Eagles.